For years, I’ve been searching for a pair of workout earphones that do it all—totally sweat-proof ones that stay put in my ears, don’t hurt, let me hear what’s going on around me, and have decent sound. During those years, I’ve tried countless pairs, with varying success…but they’ve all managed to come up short. Until now. 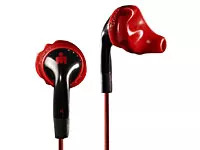 Created by two hard-core athletes (an Ironman triathlete and a marathoner), my new pair of fire-engine red Ironman Inspire "yurbuds" come through for all of my needs. Sweat-proof? Yep. Made of silicone, they shrug off sweat like it's nothing. Stay put? Absolutely. These little guys are made with something the company calls “Twist-Lock Technology,” the idea being that you put them in your ears, give a little twist, and they’ll stay in place no matter what. In an attempt to dislodge them I pumped through an intense, pouring-down-my-face-sweaty session on my Spin bike, followed by a few rounds of jumping jacks. They didn’t budge at all. Don’t hurt? Affirmative. Well, once I got them in correctly, that is (it took a couple tries at first). But after that, they felt just fine. Let me hear my surroundings? A resounding yes to this one. I rarely wear earbuds while walking or skating because until now I’ve never been confident I’d be able to hear a car coming up behind me. The yurbuds do a better job letting ambient noise through than any others I’ve tried. Heck, while wearing them, I could hear my husband walking around in the next room. Decent sound? Yes. Admittedly, it’s not like listening to a pair of Bose speakers, but I wouldn’t expect that sort of quality from a pair of earbuds. So as workout headphones go, the sound was fine. About the cord: It’s actually made of kevlar (yes, the fiber used in body armor), and not only does it look pretty cool, it also doesn’t get twisted when I move around. Oddly though, it actually gets quite tangled if you toss the earbuds carelessly in the little pouch that comes with them. But that is a very small price to pay for a really great pair of workout earphones. Pros: They’re sweat-proof and comfy to wear, plus they won’t fall out no matter how hard you exercise. Also, they allow you to hear what’s going on around you, which is crucial for safety when you’re out on the road. The sound is decent, too. Cons: Putting them in correctly takes a bit of practice, plus the cord can tangle when stored in the accompanying pouch. Extra tip: When putting the earbuds in, nestle them instead of cramming them.